Campfire: Can we lock rooms, have confidential chats, and/or prevent users from accessing certain rooms in Campfire? Can we lock rooms, have confidential chats, and/or prevent users from accessing certain rooms in Campfire? To lock a room: In the upper right of every room, next to “Who’s here,” is a link that says “Lock room.” When you click on it, this room is locked and off the record. Only admins can enter a locked room. Any conversations (and uploaded files) will not be logged to the transcript while the room is locked. Only admins can give access to rooms. 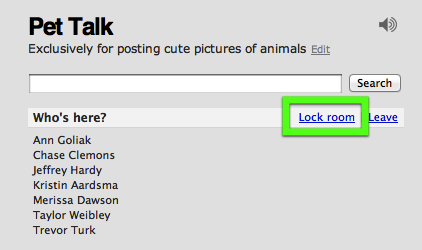 To give/remove access to a room: Click on the “Users” tab in the upper right of the screen. Then find the person you want to remove access from and click the link associated with their name that says “Change.” You can then select which rooms they can access (a checkmark means they can access that room). This person will only be able to enter and view transcripts for the rooms chosen here.